Glowy: Lady Gaga in Versace “Idol” Pointed Toe Pumps. 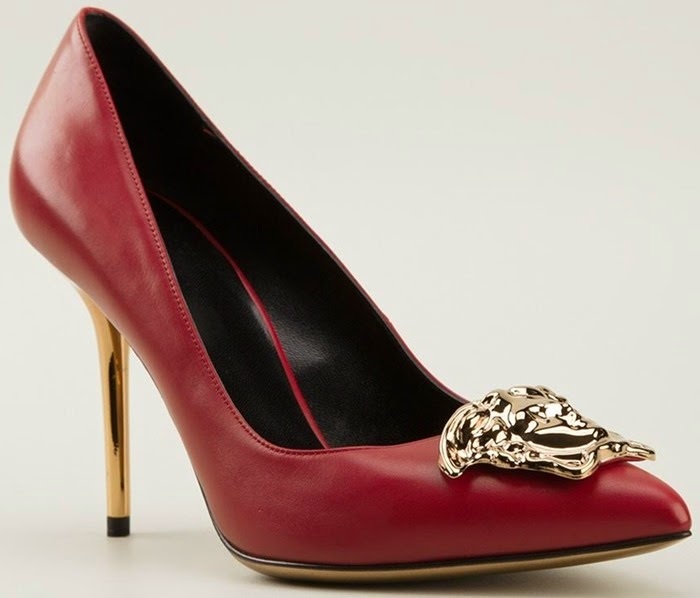 Lady Gaga in Versace “Idol” Pointed Toe Pumps. Lady Gaga was photographed inside the airport terminal while heading to catch her flight on Saturday night November 8 in Barcelona, Spain after Palau Sant Jordi concert. the singer who has a weird and over the top sense of fashion rocked a retro look which consisted of a velour jacket on a low-cut black bra-let and a corduroy skirt while finishing up with a Versace “Idol” pumps which features a red calf leather ,a pointy toe,a gold-tone Medusa head plaque at the toe and a 4 inch gold-tone stiletto heel. Her shoe can be purchased at Farfetch.